I have to admit that there are 2 things that I love to eat, one of them is bread and the other is everything that has a mango flavor, so you can imagine my reaction when I have both of them combined in the same food. When I saw this recipe I said to myself, “Mac, you have to share this recipe with the friends that read Mexico Food and More”. 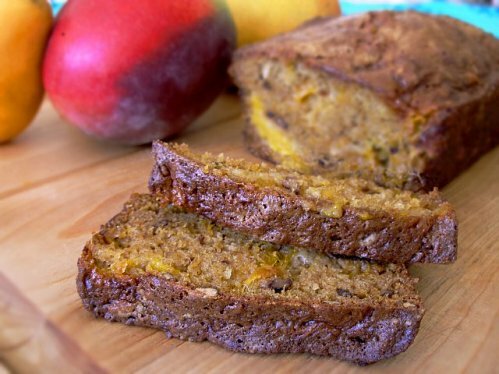 And thanks that we have access to plenty of mangos here in Mexico during the spring season (and I’m sure in many parts of the world), why don’t you give it a try to this delicious bread recipe? ready? Here we go! Combine the flour, sugar, salt, ground cinnamon and the 3 eggs in a large bowl. Make a well in centre of dry ingredients, combine the eggs and oil, stirring until just moistened. Stir in chopped mango, pecan nuts and lime juice. Add raisins if you want. Spoon batter into 2 greased/floured loaf pans, preferably medium size. Bake at 375 °F (medium-hot oven) for approximately 45 minutes to an hour or until a knife inserted in the bread comes out clean. Cool loaves in pans on wire racks for about 10 minutes. Remove the loaves from the pans and let them cool completely on the wire racks. I would personally suggest that if you like milk, serve some in a glass and enjoy every bite of this mango bread. This entry is filed under Bread. You can follow any responses to this entry through the RSS 2.0 feed. You can skip to the end and leave a response. Pinging is currently not allowed.